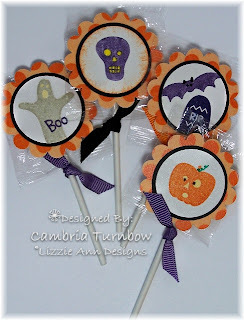 I love making Halloween treats! Halloween is just plain fun! 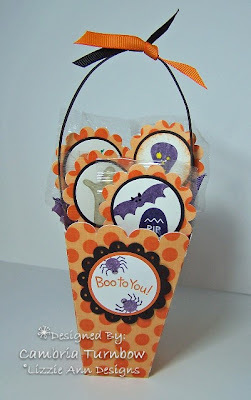 This is a little Halloween treat box filled with suckers. I made the box with Chatterbox paper and my Cricut Machine. I need to use that machine more. How easy!! I used the Tags, Bags, Boxes and More Cartridge set on number 5. It doesn't score for you, but it does leave a little line where you are suppose to score. If you have a Scor-Pal, it's super easy and you end up with a really professional looking box. I'm thrilled with how this turned out. That Chatterbox paper is really sturdy... reminds me of wallpaper, it's nice and strong... and double sided so the inside looks as nice as the outside. The suckers are covered in the same paper. 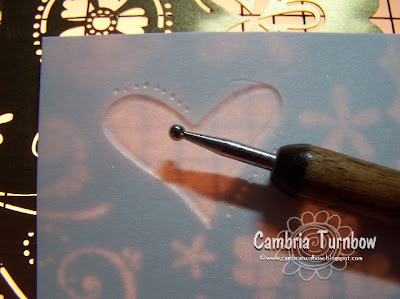 I used my new Circle Scallop Punch from Stampin' Up!, and both the 1 1/4 and 1 3/8 circle punches. Very easy. The handle is basic black card stock attached with purple Ice Circle Rhinestones.... also from Stampin'Up!. I used my Sakura Gelly Roll pens to add some sparkle and dimension to the bat and the ghost. LOVE those pens!!! And, finally some grosgrain ribbon to the handle. Trick or Treat baby!!! Okay... so fellow design team member Lindsey Botkin (Jacksonbelle on SCS) is having a fun contest over at her blog Embellished. 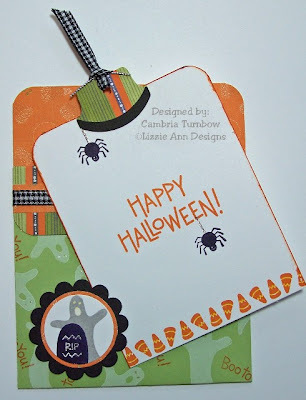 If you have some Lizzie Anne Design stamps, you better go and and check it out. If you don't have any Lizzie Anne Design stamps.. what are you waiting for? You will not be disappointed in these stamps girls.. I totally adore them!!! I just ordered another set and I can't wait to get it out and play. Go, check out the contest..... she is giving away awesome prizes!!! I hope to find some time to stamp today, but summer is just keeping me crazy busy. I wanted to do some more challenges over at SCS .... I had such a fun weekend hanging out over there in the Dare to Get Dirty Challenges Gallery. WOW... talk about inspiration. Hope you all had a great weekend... thanks for visiting!! The main image is on glossy. The technique is Versamark resist. Just run your roller wheel through your Versamark pad, then over your glossy paper. Take a brayer and ink it with whatever color you want (Certainly Celery here), then roll over the top of your glossy paper. Take a tissue and whip off the excess and the Versamark will show through! I then stamped the butterfly with classic Pink Passion ink. Other: Three for You Punch Box, Soft Subtles Brads, Dimensionals, Sweet Shop Ribbon Originals, Crafter's Tool Kit, Janome Sew Mini, Scor-Pal. I can't stop making pocket cards.... especially with the Cutie Pie Designer Paper. I can't put down the new Circle Scallop Punch from SU! either. I've also been using up the paper that I have from the Palette O' Prints promotion. Good thing I can replenish my Certainly Celery with a whole package now.... I'm almost complete out of that color. Hey.... you know the So Saffron paper would match the Cutie Pie too. I could have punched the scallop part out of some of that Saffron colored paper. Hmmm....maybe for the next one. Pocket cards are easy peasy. Just cut your card stock 4 1/4 x 11, score at 5.5 and then 1 1/4 inch from one end. The insert is 4.5 x 3.5 if you are using the Round Tab Punch. This one is stitched closed (because I CAN SEW *giggle*), but if you are using adhesive, be careful to just put a small amount on the sides or your insert won't slide in and out easily. 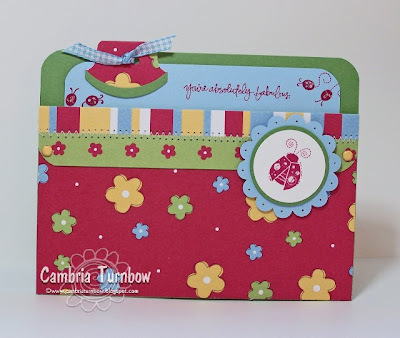 I think this Garden Whimsy set from Stampin'Up! is for sure a favorite out of the new catalog. I love solid stamps that stamp out easy and pretty. You can just whip out cute cards in seconds. Hope you all are having a fun weekend. If you are a Fan Club member, go over to SCS and check out the Dare To Get Dirty Gallery! And, thanks so much if you played along with my challenge for yesterday! Dang... you girls can pink it up good baby!!! Okay.... so if you haven't heard, SCS is celebrating their third year of the Fan Club. There are challenges going on all day by current and former Dirty Girls. One of them, I am hosting..... I wonder if you can guess my challenge? If you are a fan club member, stop on over and play along with us. If you aren't a member, it's not to late to join the fun. Friday is the day to get dirty with me baby!! That patterned paper is from Chatterbox. The pattern above is the opposite side of the polka dots. The ribbon is May Arts from Cindy at Starlitstudios. 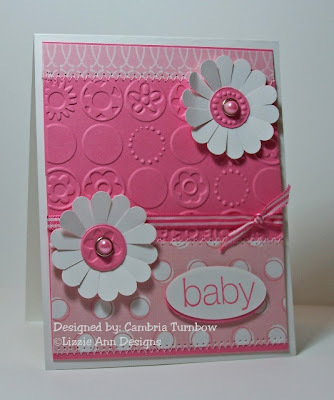 Baby sentiment is from Lizzie Anne Designs. 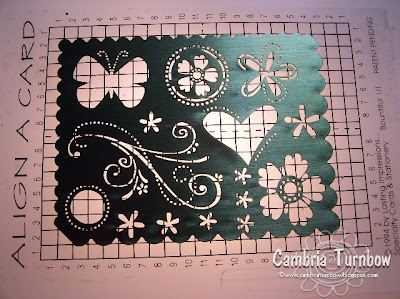 I used this embossing folder for the Cuttlebug. Other: Pearly Brads, Cuttlebug, Bloom Dots Embossing Folder, Janome Sew Mini, Circle Scallop Punch, 3/4 Inch Circle Punch, Small and Large Oval Punches, Cindy Ribbon (Startlitstudio), Dimensionals, Paper Snips, Scor-Pal. Hope you can come over and join me in the challenge!! Have a super Friday!!! TGIF baby!! Have you been over to SCS this week? They are having all kinds of fun challenges for fan club members!! If you aren't a member, it's not too late.. come and celebrate three years with us!! Get dirty with all the dirty girls!! I'm playing in one of the challenges today..... it's a sketch from dirty girl Beate. I have a challenge coming up tomorrow. I hope you'll go over and play along. Can you guess what my challenge is? LOVE these snowflakes!! 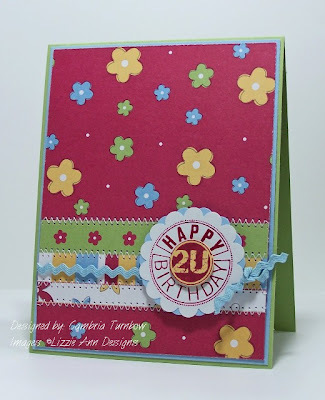 It's my August assignment from Lizzie Anne Designs. Oh, how I ADORE this set. This one is called Christmas in the City. And, I also used the Shapes and Stitches.... I didn't really sew with my machine on this one! It's a stamp... really it is!!! Okay... so if you are a fan club member, check out the challenges and upload to the special Get Dirty Gallery!!! Paper: Regal Rose, Shimmery White, Chatterbox patterned paper. Other: Round Ice Rhinestones, Dimensionals, Sakura Glitter Pen, Circle Punches and Circle Scallop Punch, Scor-Pal. Don't forget to come over to SCS and play my challenge tomorrow!! Lots of fun challenges all week long!!! Thanks for stopping by! I'm having so much fun with these images from Lizzie Anne Designs. I wish you could see the details better in the photo. I had fun using my Sakura Gelly Roll Glitter and Glaze Pens. The windows and the ghosts are all raised and shiny along with the black on the top of the haunted house. I love those pens! It really makes images pop. This set is called Spooked, and it's SO perfect for everything Halloween. I'm working on something else that I can show you in the next day or two, to pack up treats..... who doesn't love Halloween treats? The designer paper is from Chatterbox. I LOVE the texture of that paper. It's like none I've had before. Yes... I sewed. :) I can't help it... I hope you all aren't getting sick of me and my sewing machine. I have the set from Lizzie Anne designs with the stitches too... and I WILL use it soon. I couldn't WAIT to get it.... now to find more time to play. :) Have you seen that set? Oh, it's a must have... ribbon, stitches and shapes. Okay... I'm gettin' it out tomorrow. Take a peek... it's this one: Stitches & Shapes. See.... I told ya. Must have!!! Other: Jumbo Eyelets, Crop-a-dile, Grosgrain Ribbon, Slot Punch, Corner Punch, Vintage Brads, Sakura Pens, Dimensionals, Janome Sew Mini, Crafter's Tool Kit. Distressing Tool, Scor-Pal. Hope you are all having a nice summer and staying cool. Thanks for stopping by! Today is Meridith's birthday!! You know, one of the talented chicks over at Lizzie Anne Designs!! Have I told you that I love Lizzie Anne Designs? Yah, I think I have.... *wink*. These gals are SO nice! I just can't get over the fact that I get to work with them. If you haven't been over there to check out their stamp line, you are missing out baby. I was THRILLED to get this sentiment set in my design team kit. It's called Simply Sentiments... I love them all. Oh man, do I love everything over there or what? Great news.... my favorite online store is now carrying some of the Lizzie Anne Designs stamps!! Check them out over at http://www.eclecticpaperie.com/. While you're over there, check out the eP blog for details on CHA! Other: Circle Scallop Punch, 3/4 inch Circle Punch, Dimensionals, Cindy Ribbon (starlitstudios), Janome Sew Mini sewing machine, Scor-Pal. Have a super weekend everyone!! Thanks for stopping by!! AND it's pink... Whooo Hoooo, I rock!! Thanks Dorinda, Pinie, and Elizabeth!! Check out their awesbomb blogs by clicking on their names!! 1. 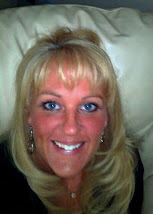 Kendra... oh, how she rocks my world!!! Gotta check her out!! 3. Stevie..... LOVE her!! Yah, she is rockin for sure!!! 4. Asela...... HOLY COW! I want to color like Asela! DANG! 5. Mounds..... the definition of ROCKIN!!! I could list a zillion women who rock my world!! I'm so blessed with good friends!! Oh yah baby.... I gasped out loud when I cracked open my new Stampin' Up! Catalog and spied the beautiful designer paper. I'm spoiled now and I always want the double sided. It's all totally dreamy and I can't wait to get my hands on every piece. You think I can do it before the next catalog comes out? I doubt it, but I'm gonna try. LOL. This paper is called Cutie Pie and it is SO stinkin' cute. The stamp set is called Garden Whimsy. It's one of the new sets in the SU! catalog. 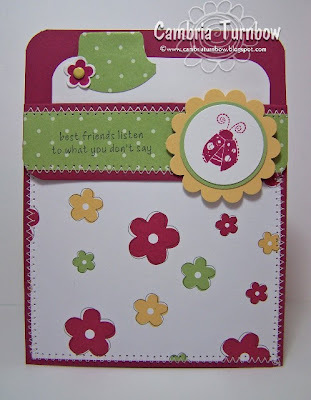 I also used the sentiment stamp set Absolutely Fabulous. That set reminds me of my friend Mounds (Joy). Not only because she is fabulous, but because she is always saying "absolutely". This is another pocket card (can you tell I'm diggin' pocket cards? ), only this one is in the opposite direction as the previous one. Cut your paper at 5.5 x 8.5, score at 4 1/4 and 7.5. Fold down your flap and add your paper. Oh yah, I'm still sewing with my little jewel of a machine too. You see the stitching across the flap? It holds it down quite nicely. Other: Both Circle Punches, Circle Scallop Punch, Round Tab Punch, Double Circle Punch, Blue Gingham Ribbon, Corner Rounder Punch, Crafter's Tool Kit. Soft Subtle Brads, Dimensionals, Sakura Glitter Pen, Scor-Pal. Hope you are all staying cool and enjoying those sunny days! Thanks for stopping by!! 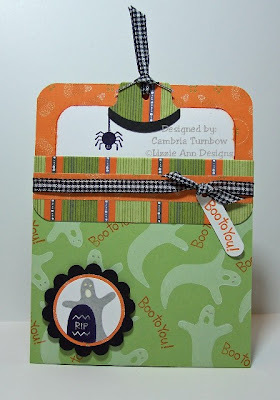 I adore Halloween cards! They are one of my favorite to create. 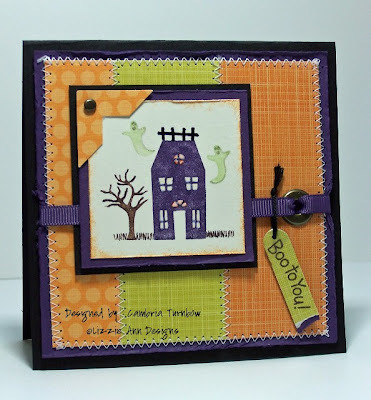 This adorable set is called Spooked from Lizzie Anne's Little Bits Stamp line. The set comes in a cd case, clear on one side and on the other is an insert of all the images and the name of the set. These are going to be so easy to store and use! They look just like other wood mounted rubber stamps except they are die cut and they cling to the acrylic blocks. I'm impressed, and, even MORE excited (if that is possible) to get these stamps to play with!! This is a pocket card....they are so much fun! Just cut your card stock 4 1/4 x 11, score at 5.5, then score another inch or inch and a half from one end and fold over. Make your insert 4 3/4 x 3.5. So, you may have noticed, I've been off the computer. I'm working on getting my back better and it's working too! I am limited to the amount of time that I can sit. If you've emailed me, please, please forgive me if I haven't gotten back to you yet. Thanks for your patience and for continuing to visit my blog. Hope you are all having a wonderful summer. 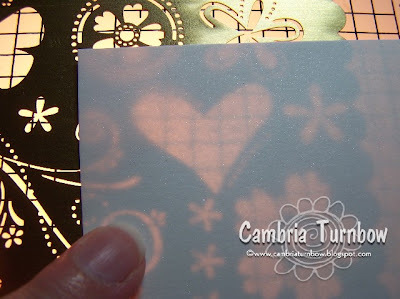 I am so happy to see the classy brass templates to go with some of the sets in the new StampinUp! catalog! I LOVE dry embossing! And, when I saw all the new yummy papers, I gasped! I need them all. But, of course, those who know me could guess that the Flowers For You Double Sided DS Paper would FOR SURE be on my first order. I messed up with the sentiment, so I had to cover it up. I'm not super happy with that part, but it works for a quick card. I got one cut out of my scalloped punch.... barely. I got a defected one, so another is on the way. I KNOW I'm going to use the heck out of that new punch!! I hope it arrives soon. Gotta love Stampin'Up customer support.. they are awesome! The butterfly and the flowers on the bottom are all dry embossed with the Priceless Classy Brass Template. The sentiment is from the hostess set So Many Things, and raised up with dimensionals. I used the Word Window Punch to punch that out and cover my boo boo. Okay... so we are out of milk. So that means a dreaded trip to the grocery store today. I'm also working on some projects with a deadline, and my sitting time is limited, so I'll try and post again soon. I'm so happy to have my new stuff from Stampin'Up!! Hope you all get to play soon! Other: 1 3/8 Circle Punch, Scalloped Circle Punch, Word Window Punch, Dimensionals, Classy Brass Priceless Template, Stylus, Stampin'Write Markers, Celery Grosgrain, Sewing Machine (Janome Sew Mini). Okay, Okay.... I'm playing! I've been tagged!!! I got it good baby! Thanks Paula, Shell, and Misty! * Tag 7 other bloggers to do the same. * Post rules and the bloggers I tagged here. * Leave tagged bloggers comments on their site so they know they've been tagged. 1. I'm on the Lizzie Anne Design Team!!!! I'm so excited!!! 2. I am frumpy in real life. Most days my hair is up in a scrunchie w/no makeup. 3. I dread the grocery store and will put it off until we are out of milk. 4. I learned to water ski when I was 8 yrs. old. 5. I live in the same town I was born in. 6. If it needs to be ironed, I don't buy it. 7. I met my husband when I was 17... he is still the love of my life. Thanks girls... have a super day!!! 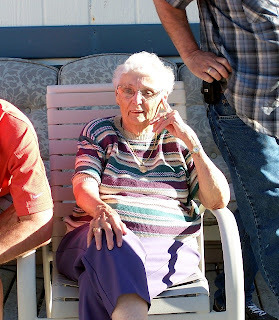 My Grandma had a wonderful birthday. You can see her in the middle.. covered with kids. Everyone wanted to sit on G-ma's lap (well, the kids anyway). It was a beautiful day at the lake. Almost everyone made it here for the celebration. We all got a little sunburned despite layers of sunscreen. 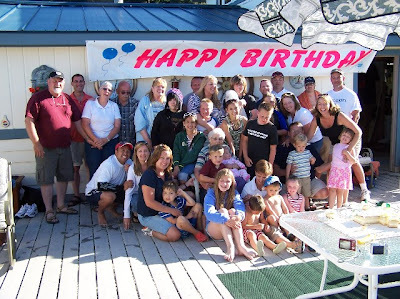 The jet skis and boats were pulling kids non-stop in tubes, and everyone was stuffed with good food and birthday cake. Grandma was so happy and all of us were so thankful to have her there and enjoying all her grandkids and great grandkids. You'd never believe it was just two months since her open heart surgery. She is my hero. Some family members stayed for the 4th and it continued to be the best of times. I am blessed to have such a wonderful family. I love them all so dearly. I unfortunately over did it a bit and was miserable with back pain. The rest of the week, I spent doing my exercises and trying to recover... which included staying off the computer and not sitting as much as possible. Thanks for the emails asking if I'm okay, and please forgive me if I haven't replied to you yet. I am catching up slowly and my back is improving each day, but I am limited to how long I can sit for now. Hope you all had a wonderful 4th of July!! Sorry I've been MIA. I appreciate all the comments. Thanks for stopping by!